Many see assisted living facilities as a convenient bridge between the home and the nursing home, but reports from CBS 2 Chicago indicate that that bridge might not be as smooth as you think. Two Sunrise living centers have come under attack for what some seem to think is a pattern of resident neglect and mismanagement. Marie-Rose Demkowicz lived in one of these establishments. 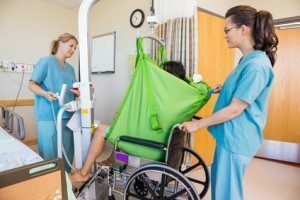 She sought it out and decided to live there because she was having trouble with hip problems and though that this facility could help her move around and use the bathroom. What she found and what she claims in a recently filed lawsuit is that the staff at Sunrise failed to pay attention to her or heed or calls for help. As a result, she was given assistance while using the bathroom and fell down over a dozen times. Family of Marie-Rose also report that the staff tried to cover up their tardiness by resetting or rewriting records. This is not the only story of neglect to emerge from the chain of Sunrise facilities-there are nineteen in the Chicago-land area. Another lawsuit alleges that the oxygen tank of a resident was not working or empty for a period of more than a month and a half. The person later died of respiratory failure. However, staff at Sunrise ignored more than patients. According to allegations filed, they also disregarded instructions from outside doctors about the treatment of bed sores of certain patients. As a result, and because they did not receive the care needed, the sores developed to a worse stage. This should have triggered the transfer from Sunrise to a location with more care options, but this did not happen-and some allege it was because the facility had more to gain by stopping their transfer. The Illinois Department of Public Health has stepped in over the last few years and cited various Sunrise facilities for almost a dozen violations, including lack of employee training, lack of oversight of drug dispersal, lack of reporting of resident injuries, and so on. However, one must wonder the value of these violations to persons or harmed or families of the persons harmed. They certainly do not compensate for the decline in quality of life. Every year, nursing home neglect affects hundreds of thousands of people. Now is the time to seek information and advocacy to guarantee that the next person abused or forgotten is not you or your loved one.